Over the next several days and weeks, thousands of articles, blogs and videos will come out discussing the legacy of Steve Jobs and Apple. They will use the terminology “Genius”, “Perfectionist”, “Visionary”, “Pioneer”, “Icon” and “Entrepreneur” They are all true. Some would even say he held a crystal ball with the prophecy to the future. In 1984, a commercial aired during the Superbowl, one that would only be aired one additional time, using the George Orwell fantasized view of the future as the back drop for a new world order in technology. With a sledgehammer and a vision, our black and white conformist view of technology and advancement would be destroyed forever. The new industrial revolution had begun. A crazy man who dared to be different would lead us to this promise land. In 1987, Apple Computer Knowledge Navigator was an ad campaign depicting a professor in the future sitting at his desk talking to his personal computing assistant on his touch screen device. For those of you that learned of “Siri” on the new IPhone 4s, you may start getting some chills. As you look closely at the screen and listen to the exchanges between the professor and the computing assistant, you will determine this ad was to have taken place on September 16th, 2011, just days before the release of the new IPhone. Prophesy or flawless execution? As I learned of the news of Steve Jobs passing from a friend in Silicon Valley, minutes before the Social hurricane of knowledge would leak, I was as an outdoor concert witnessing dogs roaming free, friends taking pictures, couples holding hands, bonfires to warm the crowd and young musicians gleaming at the thought of a crowd to listen to their sound. It was a bit of bohemian utopia and an escape from the trials we each undergo in our daily lives. I sat in the back of the field reflecting on this moment as the news sunk in. The news brought profound sadness. As many of us expected this, we just didn’t how soon. What I began to do was put life in historical perspective. What did Steve Jobs mean to my generation and how will his name appear in the historical archives for generations to come. Bear witness to the likes of Bell, Einstein, Dylan, Henson, Ghandi and Washington. He has shaped a culture and defined a generation not merely with his products and vision, but how his products have shaped the world in our professional, personal, and academic lives. Every aspect of our lives through education, music, careers and communication have been pioneered by this man who stood well above humanity. When I look back at some of the historic Apple events with the introduction of the IPod, IPhone and IPad, and even some of the less critical consumer releases, I cannot help but be in awe at the prominence and importance he demanded each time he took the stage and spoke. He wasn’t a man of political stature or even bold dominance, but he could make the world stand still in anticipation of his words. He brought more global attention when he spoke than most presidents in the last three decades. He offered us a glimpse into the future. Each time we thought he reached the pinnacle of success, he engineered a screening into the extraordinary world of tomorrow. In perfection and simplicity, Steve Jobs forced us to look inside our own minds and strive for the impossible. He saw challenge as opportunity. He didn’t look to beat the competition, but create something entirely new that no one could ever envision. In a way, Steve Jobs determined his own mortality. Spending countless hours in design, development, testing, marketing and leading what is now the most valuable company in the United States, his work with Pixar and his operating system, Steve knew the sacrifices he was making for himself, his family and the world. He once said at a commencement speech at Stanford University that he didn’t expect to live past 30. He did and we must all be thankful for that. Whether you are a techie or not, it is hard to imagine a world without Steve Jobs. He went much deeper than his technology. He saw a better world where we could be creative with the use of colors, sounds, visions. He brought families closer together through video and photo technology and allowed us to believe that each of us is our own person with individual thoughts and beliefs. If there is one thing I can take away from Steve Jobs, is that he always believed that we all have the power to be great. He saw that in his partners, his staff, friends, family, consumers and competitors. When the Technology Mount Rushmore is constructed, Steve Jobs will be the first face from the left forever etched in our memory as a forefather, pioneer and legend. 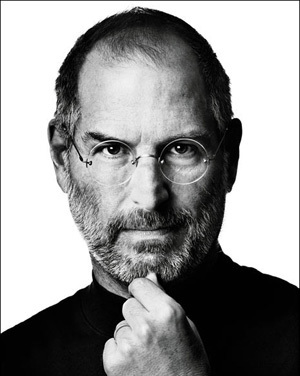 When we think about the musicians creating the soundtrack of our lives, children learning on the IPad, photographers perfecting their views of the world, entrepreneurs pursuing their dreams, military using high tech schematics on the battlefield, architects laying out the designs for the next building to the heavens or the next young actor creating his video audition for Steven Spielberg, remember, that Steve Jobs spirit continues to be in each of us. The heart to make this world a better place. Tonight we hold our heads down but tomorrow we rejoice in the life you led and the legacy you continue to carry on. Next Wake up from the grave and start living…. Great article. The smartest move he made was to put MAC’s in schools. Unfortunately, my school barely had a computer lab, let alone progressive thinkers. God Bless you Steve Jobs ! I don’t even know how I stopped up here, but I thought this publish was once good. I do not understand who you might be but definitely you’re going to a famous blogger if you are not already. Cheers!